So the newest breed of livestock farmers are starting to refer to themselves as Grass Farmers, and many Organic Farmers are proud to claim a bio-intensive form of agriculture-farming with nature rather than fighting it. And now one of my favorite bumper stickers (the title of this post) is taking on a new meaning now that I have finished Volume 1 of David Jacke’s Edible Forest Gardens. I know I have stated that in something like my last 3 posts, but forging through 350 pages of what is essentially an Ecology Textbook takes some doing. Don’t get me wrong-the book was incredibly enjoyable and I learned an immense amount about, well, Edible Forest Gardens. It did get rough at times, as I was looking for a “how to” for temperate permaculture, which Vol 1 is not (though it looks like Vol 2 [en route] is). Vol 1 is rather a statement of the vision and theory behind forest gardening (creating self-sustaining perennial agriculture) while giving the reader (student?) a more than cursory understanding of the principles of the science of Ecology. The book is valuable if for no other reason than their incredibly thorough appendix titled their Top 100 Useful Plants. Wow. As I stated in my last post, the biggest take away for me was in the 100 pages or so that deal with ecology. That is a good thing, because after 100 pages on ecology you need a tid bit or two! I will try to paraphrase my aha! here. Many of us aspiring orchardists have heard that a grassy understory can be detrimental to apple trees. I have heard numerous reasons why, but the main reasons center around resource squabbling between the shallow rooted apple tree and the shallow rooted turf grasses. That kind-of made sense, but it never felt truly right to me-too simplistic. Jacke clues his readers in on a relatively new frontier of soil ecology- the ratios of bacteria to fungus in the soil horizons as another possible reason. Without getting too technical, grass or freshly disturbed areas typically have a very high bacteria to fungus ratio-there is typically little carbon material in the soils for the fungus to feed on and bacteria are more flexible on the relatively higher nitrogen levels in the organic matter in either disturbed sites or under sod. However, trees, and even shrubs and many perennials, have evolved to live in a mutually beneficial existence with various fungus and one (mycorrhizal) in particular is turning out to be one of the absolute powerhouses of the forest. Basically the fungus lives on or near the roots of the trees and in an exchange similar to rhibosomal bacteria in legumes, gives nutrients and water to the tree for sugar intensive root secretions. Sounds neat and all but why should we care? Here is the tidbit that blew my mind: take a table spoon or two of really good old growth soil. In that dollop of soil there may be as many as 40 miles worth of mycelial “hairs” and, in the soil, nutrient uptake is all about surface area. Dang! But here is the kicker: the fungus is sensitive-every know “-cide” has shown to be damaging to it including the more innocuous ones like Round-Up. So if you live in a new subdivision like me and have dead subsoil, or are living in virtually any other developed soil on Earth you almost certainly have a soil dead to fungus. This is essentially forcing our trees and gardens to try to soldier on alone uphill with one leg chained to a 50lb chunk of lead. Not only are we missing an essential component of the decomposer web in our soils, we have also hamstrung our gardens by taking away one of their staunchest allies. So I will be running an experiment in my lawn and some of my gardens this year. I have ordered mycorrhizal fungus inoculants for both my veggies and my lawn from Fungi.com and will keep you posted on the results. Speaking of Fungi.com, they offer an immense line of fungus products allowing you to grow your own edible mushrooms. Some, like the Shitake, need a log to be inoculated and then placed in contact with the soil, but several others would like nothing more to live in (and aggressively decompose) the wood chip mulch in your perennial beds. In return they will give you a harvest every year for the next several years or more. Loathe turning your compost bin and have some time on your hands? Inoculate the pile (or a round bale of straw!) with their The Garden Giant™ (Stropharia rugoso-annulata) and sit back as you harvest some utterly immense mushrooms while the fungus turns the carbon into compost. Fukuoka would be pleased!! I plan on inoculating the mulch layers of my sheet compost with the Stropharia and perhaps some others as soon as the beds go in next week if for no other reason than to see a 3′ mushroom! Wow. 10 days and 3500 miles with 2 toddlers and 7 adults in an epic memory fest week of driving, wildlife and some of the most scenic country our nation has to offer. It was fantastic to see Yellowstone again after almost 6 years-the pines have had almost 20 years to recover from the fire and their success was a fantastic backdrop in succession and disturbance recovery to my reading for the trip (Edible Forest Gardening, by David Jacke). The pines seemed small for 20 years old, until my research turned up that Lodgepole Pines take at least 100 years to reach “commercial” diameter. Why in god’s name do we log in the Rockies again? The trees that were spared are beautiful-majestic and exuding history and wisdom with every needle. But now we have returned, the lawn was literally over a foot tall and I quick harvested 2 lbs of radishes before dark before they split. My hastily transplanted peppers, lettuce, tomatoes, mache, and melons all survived. The prairie is 2-3′ tall and the potato plants are a foot above their holes and the strawberry crop looks to be incredible. With 48 transplants awaiting on the porch from Seed Savers to cover my losses from the windstorm that killed 2 flats and also to bulk up for my restaurant sales, 3 weeks of weeding to catch up on, and a shoebox of seeds to get in 2 weeks late I have a busy day ahead of me! Finished vol 1 of Edible Forest Gardening and will be placing my tree orders for the “canopy” layer of my guilds this week. Paw-Paw, Alder, Locust, Pear, Persimmon, Plums will all be in attendance with an understory of shrubs and edible forbs and herbs with a thick groundcover of edibles to round things off. Vines will be trained along the fences (Fox Grapes and Hardy Kiwi)- there is an immense amount of work in the next 2 weeks, but Someday Gardens has cashflow and this is what it was designed to do-fund my horticultural experiments. Finally, I will begin inoculating my wood chip mulches with edible mushroom spawn. I know very little about this right now but resources like ATTRA and Fungi.com are allowing me to fill the gap very quickly. My biggest initial take away from Edible Forest Gardening was the wealth of knowledge of the soil ecosystem and its critical importance to garden success. Basically if you ain’t got fungus you ain’t got a healthy garden. A healthy soil will be fine, but a farm field that has been brought to its knees by chemical sprays, or my subsoil backfill subdivision will need some intervention to catch up. Its official-I am a Centurion! Last Friday on a return trips from a garden install (yes I install gardens using an Insight!) I achieved the insane 102.2 MPG over the same 17 mile commute that I had previously achieved the impressive 92.8 numbers of LY. Other than being able to apply all the subtle learning’s that I have gained in the past 14 months of hypermiling, the single biggest difference is so simple as to be embarrassing. My commute has a 5 mile stretch that is hilly. 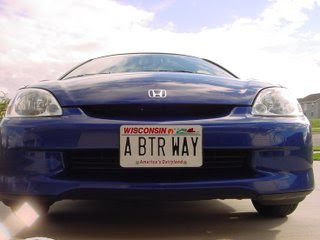 Now I have always said that my record runs are not normal driving-I rarely break 55mph and I use back county roads, creeping up hills and coasting down them. But as these are public roads I would also always keep the speed over 45mph or so. That is absolutely fine with the exception of 3 of the hills that I must dip pretty hard into the throttle to maintain 45mph up the steeper inclines. For some reason this time I thought “Why not just throw the blinkers on and climb them at 100mpg?”. What the hell! Actually on only one did I have to resort to the blinkers to get someone to pass as I crawled up at 39mph (in a 55 zone), but the mental shift of not having to dip into the gas engine was enough to earn me inclusion into that elite status of the 100+ MPG club. I know this was a purely academic exercise, but the proof is there- 100mpg commuting is possible with current technology. Sure the commute took longer, but I made it from work to home, in an internal combustion powered car and averaged over 100mpg. Sorry for the lapse in posting-trust me its been a whirlwind month!! Bad: Village President ousted in election that was an unspoken referendum on our Sustainability Initiatives-have been in damage control mode ever since due to a very unfavorable political climate (first act of new administration was to move to disband our Green Committee…[we survived, but barely]. Good: Someday Gardens has exploded-we have sold out of our entire inventory of 50 barrels YTD and have a waiting list. Am contacting suppliers as far away as Oregon to meet demand on my municipal contracts-if I find one I will actual be hiring staff! Also have enough garden installs that I am turning down new projects. Isn’t this a side business? The Village President thing hit real hard. The single biggest learning, and look for more posts on this if it ever rains so I can take a break, is that we focused our energies on the Village Board and not the Village at large. The business community was uneducated to our intent and the vocal minority was able to convince them that we were raving idealistic lunatics and enough people turned out to sway the election. Remember I live in a town of 2000 so literally 32 people decided this elections… So the next two years will be a holding action at best. We have already lost 1/3 of our committee to replacements that are intended to impede rather push our agenda which will bog down our meetings for the near future as we get them up to speed. On a much more positive note, our gardens are making extreme headway. The blueberries are in (post in the future) and the prairie from last year is coming in fantastically thick-some of the cupplant are already pushing 2′!!! Unfortunately the brutal winter seems to have taken out 90% of my Green Thuja wind break. 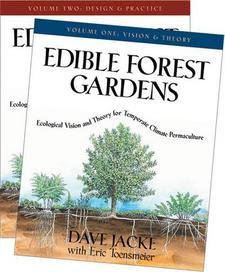 That may be a blessing in disguise as I am now reading Dave Jacke’s 2 volume Edible Forest Gardens and the information is blowing my mind. Its pricey, but the 40 page appendix on the Top 100 Most Useful Plants is enough to justify the cost alone-and there are 660 more pages to go! Add to that my new compost garden (Comfrey, Clover, and Sunchokes) and the newly installed beneficial insect attractant intensive native garden bordering my soon to be installed Orchard and life in the Beo/Mia household is very, very good! We have also planted the first of hopefully 6 Fruit Tree Guilds filled to the brim with edibles, natives, nutrient accumulators, and biomass plants all supporting a semi dwarf fruiting tree. Posts will certainly be fewer, but trust that I am out fighting the Good Fight! !